Brightly coloured Children's meal / party boxes are brilliant for parties, kid's play centres and cafes. Choose from over 40 fantastic themed party boxes. Brilliant for parties, play centres and cafes. With a range of designs to choose from there really is something for everyone! Choose with or without scoops. Cup Cake Boxes will show off your most special cup cakes to the full. Printed with your selected design on the front and back. Each bag has a cut out handle. Ideal for birthdays, lucky dips & fetes! Wide range of party items to make your day go with a bang! Stylish and very fashionable candy stripe paper bags with flat handles. They are perfect for use in Gift Stores, Boutiques & Parties. These high quality Gift Bags are made in Italy from strong 100gsm kraft paper and have twisted handles. Perfect for Gift Shops, Gift Wrapping, Paper Party Bags, Goody / Loot Bags and more. Why not add tissue paper for that complete look? 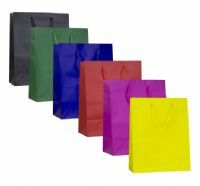 For an extra bit of quality try our Matt Laminated Gift Bags with rope handles. They are perfect for use in Gift Stores, Boutiques & Parties. Why not add tissue paper for that complete look? For an extra bit of quality try our Matt Laminated Gift Bags with rope handles. They are perfect for use in Gift Stores, Boutiques & Parties. What better way to present a gift than with our range of quality Gift Bags. With different styles & sizes there is something for everyone! Why not add tissue paper for that perfect look? Our range of vibrant acid free coloured tissue paper ideal for crafts & for present wrapping where the light weight and stunning colours will enhance your gifts or products. All our Tissue Paper is Acid Free (PH Neutral) and Bleed Resistant. Our stunning range of patterned acid free coloured tissue paper ideal for all enhancing your gifts or retail products for that Boutique look.. All our Tissue Paper is Acid Free (PH Neutral) and Bleed Resistant. Acid free tissue will not damage or tarnish delicate items. Our stunning range of patterned acid free coloured tissue paper ideal for all enhancing your Gifts or Retail Products for that Boutique look. All our Tissue Paper is Acid Free (PH Neutral) and Bleed Resistant. Acid free tissue will not damage or tarnish delicate items. Matt Laminated Gift Bags with rope handles. They are perfect for use in Gift Stores, Boutiques & Parties. Why not add tissue paper for that complete look?